Are you planning to buy a car insurance soon? The chart shown below enlists all the important details you should know before buying a policy. Under the new tax regime, which came into effect on 1 July 2017, the cascading effect of taxes on taxes has been reduced. So, what does it mean for car buyers? Will they have to pay more? What about second-hand vehicles; will GST come in to play here too? Does the new tax structure have any influence on car insurance, or EMIs? Let’s find out. The present system clubs together several taxes that used to be applicable before such as excise, VAT, sales tax, road tax, motor vehicle tax, registration duty on cars and bikes etc. Additionally, the government has proposed to levy a cess on vehicles of different segments and sizes. There is still some ambiguity in pricing and taxes as incentives and exemptions differ from state to state. Eventually, the end prices of vehicles will vary accordingly. Related: What does anti-profiteering mean in relation to GST? 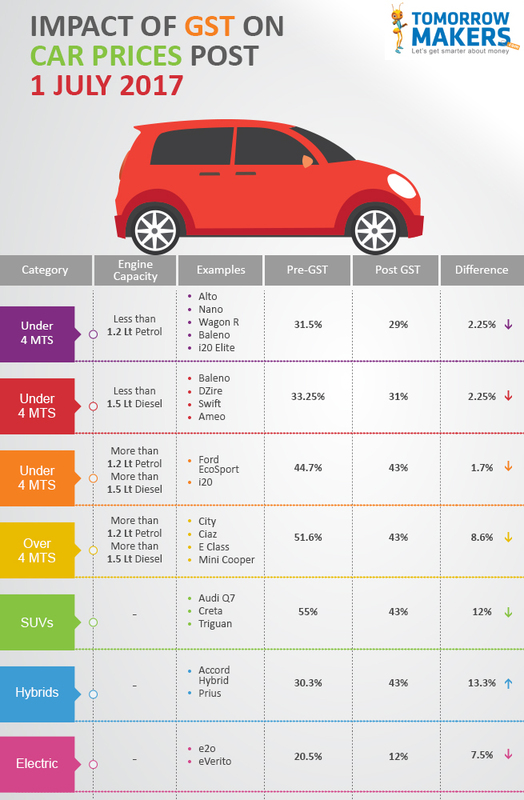 The GST proposal seems largely beneficial; small cars will not see much of a difference, but luxury cars and SUVs will become more affordable. The case, however, isn’t the same for hybrid cars. These will attract a higher tax burden, as they have been designated luxury cars and will now attract 43% GST (28% plus a cess of 15%). The same bifurcation of rate applies to large luxury cars and SUVs. The tax spike will affect the hybrid segment, especially in places where such vehicles earlier enjoyed lower VAT rates and excise duties. The tax rate on electric vehicles is fixed at 12%. On the flip side, it is feared that second-hand car buyers will likely suffer. Contrary to market expectations over the past few months, most dealerships may pass on this tax burden to customers, which means that a potential second-hand car buyer would now pay substantially higher costs. Dealers of second-hand cars must now pay GST only on their margin, and can avail input tax credits. However, in the short term, this extra tax poses a huge cost burden on them. Additionally, they cannot afford to hike prices, as doing so would run the risk of competing directly with new cars, which are now going to cost less. The only possible solution for car dealers is to buy these pre-owned cars at lower prices than the going rates during pre-GST days. This means that a second-hand car dealer, who was expecting to get Rs. 3 lakhs for a car before July, is likely to be offered a lower rate now. In the long run, however, they can reduce their losses by passing on the tax credit to customers. The GST Council announced an 18% tax rate on the insurance sector, implying a hike of about 3% over the existing 15%. As this will be directly passed on to customers, it will, in tandem, have a direct impact on the premiums of various insurance policies. (a) Comprehensive Motor Insurance: Covers third-party liability and damage caused to the vehicle. (b) Third-Party Motor Insurance: Cover against third-party liability that arises only due to property damage and/or physical injury caused to the third party involving the insured’s vehicle. The new rate of 18% will be applied on the entire premium amount. Post July 1, India’s largest automaker by units sold and revenues earned, Maruti Suzuki India, slashed selling prices of most models by up to 3%, setting the benchmark for the market. Alto will be cheaper by around Rs 2,000-Rs 5,000, while the Wagon R will cost less by about Rs 5,000-Rs 8,300, and the Swift by Rs 6,700-Rs 10,700. The Baleno is seeing lower prices by around Rs 6,600-Rs 13,100, while the Swift Dzire, India’s best-selling sedan right now, has seen a price cut of Rs 8,100-Rs 15,100. Other cars enjoying substantial price cuts include Vitara Brezza, (down by Rs 10,400-Rs 14,700) and S-Coss (down Rs 17,700-Rs 21,300). Ertiga Petrol prices reduced by Rs 21,800 and Ciaz petrol by Rs 23,400. However, the cost of Ciaz and Ertiga hybrid models spiralled after tax concessions were withdrawn under GST. For instance, the diesel variants have increased by as much as Rs. 1 lakh. Prices of small cars from Hyundai – which include the Eon, Grand i10, Elite i20, Xcent and i20 Active - also slashed costs by around Rs 8,000-Rs 24,000. Verna and Elantra – Hyundi’s sedans – witnessed larger reductions of around Rs 27,000-Rs 70,000, while its SUVs –Creta, Tucson and Santa Fe – went down by around Rs 1 to Rs 2.5 lakhs. The company’s small car section, including Nano, Tiago, Zest, Indica, Bolt, Tigor and Indigo, saw a drop between Rs 5,000 and Rs 21,000. A much bigger drop in prices were given to the Sumo, Safari and Hexa of around Rs 80,000-Rs 1.60 lakhs. Honda cut prices of its WR-V, Amaze, Jazz and Brio by up to Rs 24,000, the City by Rs 31,000 and CR-V by up to Rs 2.3 lakhs. Prices for Toyota’s Etios and Corolla decreased by Rs 57,000, while that of the Fortuner and Land Cruiser by a whopping Rs 3 to Rs 10.5 lakhs. Meanwhile, the Mahindra group has reduced the cost of the KUV100, TUV300 and Verito Vibe by up to Rs 36,000. Other popular car manufacturers such as Renault, Nissan, Ford, BMW, Volkswagen, Mercedes Benz and Jaguar also reduced prices on their respective models, with cut backs ranging from Rs 11,000 to as high as Rs 6 lakhs. Buying a term insurance plan is an important decision that must be done carefully if you want to get the most out of it.